Sweet Potatoes, Oats and Pecans–it’s almost a breakfast food! 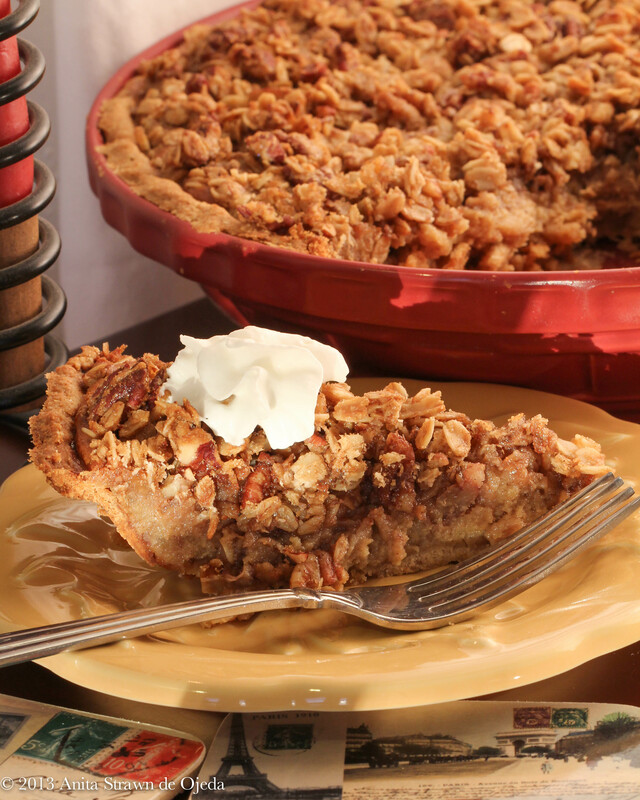 This week, we’re sharing a recipe for amazing sweet potato pecan pie. We use the white sweet potatoes, not the orange colored ones (they have a drier consistency). We hope you’ll love this rich but not-too-decadant pie! Preheat the oven to 425, and start a medium-sized kettle of water to boil. Make the whole wheat pie crust first, so that it can be cooling in the refrigerator while you prepare the pie filling and toppings. In a large bowl, mix together flour, sugar and salt. With a pastry blender or two knives, cut in the butter until the mixture resembles coarse crumbs. mix together the egg, vinegar and water, then add to the flour mixture. Mix until the dough is moist enough to form a ball. Wrap the ball in plastic and chill for 30 minutes. Divide the dough in half. On a lightly floured surface, roll one half into a 12-inch circle. Press dough into a deep pie dish. Crimp to form decorative border. While the pie crust chills, peel and chop the sweet potatoes into large rounds and put the chunks in the boiling water (make sure the water covers the sweet potatoes). When the water returns to a boil, reduce the heat, place the lid on top and simmer for about twenty minutes. While the sweet potatoes cook, mix together the ingredients for the topping and set them aside. When the sweet potatoes are tender (a fork is easily inserted into a chunk), drain the excess water and place in a large bowl. Mash the potatoes with a fork or potato masher, and then add the brown sugar, sweetened condensed milk and beat on low until everything is incorporated. Allow the mixture to cool whilst you roll out the pie crusts and place them in two deep-bottomed pie pans. Pour an equal amount of filling into each pie shell (make sure you leave room at the top of the pie for the topping) and sprinkle half of the topping on each pie. Leftover filling can be baked in small custard dishes at the same time the pie is baking. Place the pies in the oven and bake at 425˚ for 20 minutes. Lower the temperature to 350˚ and bake for an additional 40 minutes. The pie is ready when a knife inserted in the center comes out clean.